First off, sincere apologies for any mental distress that the wording of that headline may have caused you. Just try and un-think the bad thoughts. Any road up, a Greek court is examining evidence that City’s Europa League clash with Aris Salonika back in February was the target of a betting scam, and that young Carlos Tevez was allegedly approached by an Aris player to help pull the whole farago off. Prosecutors are said to have presented extracts of a phone conversation in which one of the Greek team’s players, Kostas Mendrinos, is heard suggesting he could ask his team mate – former City striker Nery Castillo – to persuade Tevez to let the Greek side kick-off. So there you go. More ‘as and when’ we suppose. It’s perhaps also worth pointing out that Castillo and Tevez never actually played together at City – as if that makes a blind bit of difference. Due to the slovenly weekly pittance he’s on at Eastlands, it’s understandable that Carlos should have to supplement his income by, perhaps…say…working the evening shift at the Eager Beaver to put himself through college, etc, etc – but match-fixing? C’mon, we reckon Carlitos can probably afford to keep his kids in buckle-up shoes without throwing the odd coin-toss here and there. Its about time someone else started defending our players, it seems I am the only one most of the time rubbishing these pathetic attacks on them. He can’t speak English let alone Greek. 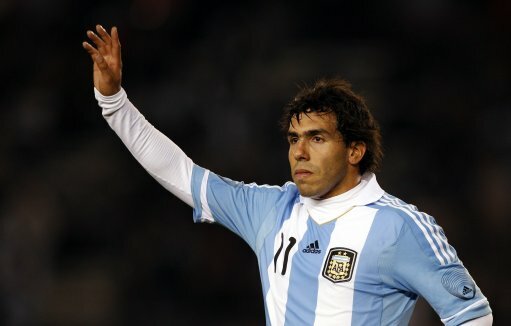 Carlos Tevez denies all knowledge. I suppose I think that sound about right.